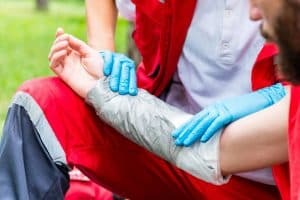 Complications That Can Occur with Burn Injuries | Larson Law Firm P.C. Burn injuries can be devastating, and they can have lasting negative impacts for the patient both physically and psychologically. The National Institutes of Health (NIH) reports that more than 500,000 people seek medical treatment for burns, 40,000 are hospitalized and about 4,000 people will die from burn injuries each year. People sustain burn injuries in the home, in motor vehicle accidents, workplace accidents and other various accidents. Infection. The skin and tissue damage from severe burns can lead to bacterial infection and make the patient more vulnerable to sepsis. Sepsis is an infection that can travel through the bloodstream quickly affecting the whole body causing shock, organ failure and can lead to death if not treated aggressively. Severe fluid and blood loss. Burns can damage blood vessels, which can lead to fluid loss and low blood volume, which can impair the heart’s ability to pump blood throughout the body. Low or high body temperature. When large portions of the skin are damaged, the body can have difficulty regulating body temperature. If the scarring affects a person’s sweat glands, it can increase his or her chance of suffering from heat stroke. Respiratory problems. Breathing hot air, smoke and ash can damage the lungs and lead to respiratory failure. Scarring. Severe buns can cause an overgrowth of scar tissue as the skin heals. This can lead to disfigurement, as well as numerous problems if the scar tissue forms inside the body (depending on the severity of the burn). Bone and joint problems. When scar tissue forms it can cause a tightening of the skin, muscles and tendons which can limit the movement of bones and joints. These contractures can permanently pull joints out of position. The physical complications from burn injuries may last months and even years as the wounds heal and the body adjusts. With severe burns, such as third or fourth degree burns, the patient might be suffering from the excruciating pain of joint contractures, which can also affect their ability to move. Some victims may become permanently disabled as a result, unable to return to work. Patients who have suffered severe burns in traumatic incidents such as a house fire or car accident may suffer deep psychological trauma from the event. They may develop PTSD (post-traumatic stress disorder), and they may experience depression and low self-esteem, if the scarring from the burns can be seen easily by other people. As the skin heals, the physical scars are a constant reminder of the trauma of the initial injury. Those who are facing the physical, emotional and psychological complications from burn injuries will require specialized medical treatment and counseling therapy to deal with the serious issues resulting from their injuries. 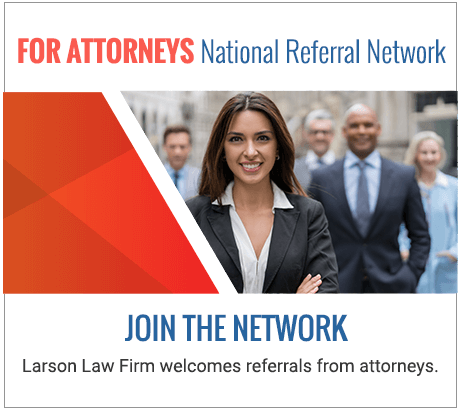 At Larson Law Firm P.C., our skilled North Dakota burn injury lawyers are here to protect your right to recover compensation when you have suffered burn injuries as the result of another person’s negligence. You are welcome to complete our contact form or call us at 701-484-HURT to schedule a free initial consultation today at our office in Minot.